It’s not a sight that you see every day, but a community project has been bringing dancing on the streets of Henderson in recent times, and all without any noise! Silent Disco Citywalk, funded by the Henderson-Massey Local Board, has been transforming Henderson town centre into a dance floor and turning strangers into the performers. It is a 60 or 90 min immersive, multi-sensory and curated adventure for groups of 10-30 people of various age and backgrounds. The special vibe at the event is created thanks to the pre-recorded soundtrack that everyone in a group hears through the Silent Disco headphones at the same time. “There are some games and surprises that pop up along the walk. Each route has its own entertainment programme that is a unique way to connect the community to the city, its public spaces, people and tell a unique story,” says Yana Papaya, the event organiser. “We created a special route to celebrate Henderson’s historical, cultural heritage and natural diversity. The walk started outside of the WestCity shopping Mall, goes through Henderson Town Centre, with a few interactive stops and activities at the Kakano Pop Up Gallery, Falls Hotel, Falls Park, Henderson Mill, dance battle at the Corban Estate Arts Centre, Henderson Park. Shane Henderson, Chair of Henderson-Massey Local Board, says the project is unique and demonstrates how dance can unify communities. 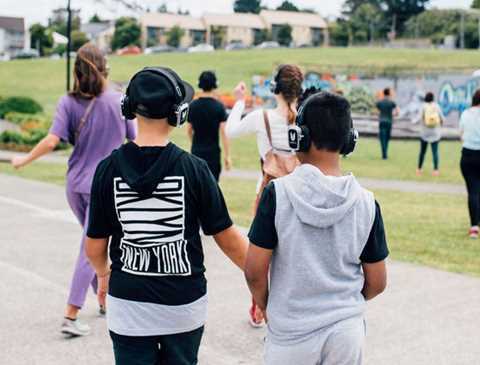 “It looks absolutely fantastic to have each group of people walking through iconic parts of Henderson and bringing it to life through dance, even if you can’t hear the music!